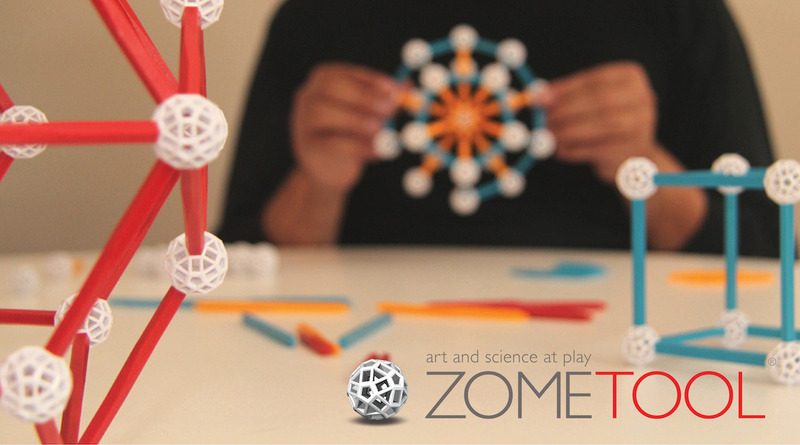 Zometool is a modern, simple and extremely versatile construction system. Children, teachers and Nobel Prize winners all love Zometool, because it links nature, science, mathematics, art and architecture in a light and easy manner. Zometool is a unique system, which works perfectly. This is due to the brilliantly conceived connecting balls and the colour-coded struts, whose lengths conform to the rules of “Divine Proportion”. Suitable for 5 year olds and adults alike to build beautiful and elegant models. The sophisticated key to the whole system is the ball with its 62 openings in three different shapes. Colour-coded struts, set into the correspondingly shaped openings in the ball, make it easy to build even complex structures. Building with Zometool means thinking in 4 dimensions: from a line (1-D), to a surface (2-D), to a solid (3-D) and on to hyperspace (4-D). Learning through discovery - We’ve all had to experience rote learning. But few of us had the chance as children to discover the phenomena which give rise to fundamental concepts in art, chemistry, physics, architecture, math, engineering and many other disciplines. Concepts such as proportion, fractals, symmetry, chirality, minimal surfaces, polyhedra, stellations, tessellations, trusses, lattices and space frames. It’s not just that they can learn the concept. They can explore the concepts in such a way that they gain a sense of ownership over their understanding.